Laura's Birding Blog: Unexpected delight! On Monday, I was working on the computer, not very productively because I kept getting distracted by the bird activity in my yard, when out of the blue I got an email from Leann Hess in Port Wing, Wisconsin. 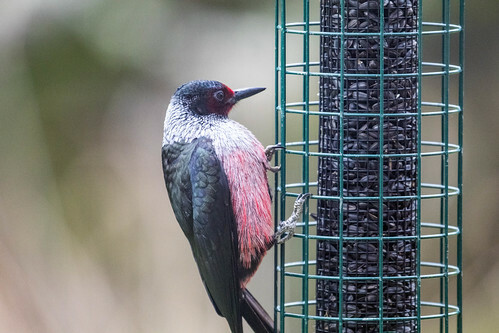 Leann was at the center of the effort to get Port Wing designated an official Bird City in Wisconsin, so it was altogether fitting that she was rewarded yesterday with a really cool bird at her feeder—the first ever Lewis's Woodpecker to be reported in Bayfield County! The moment I read her email I sent a message to Wisconsin birding guru Ryan Brady, grabbed Pip the birding dog, and hopped in the car. 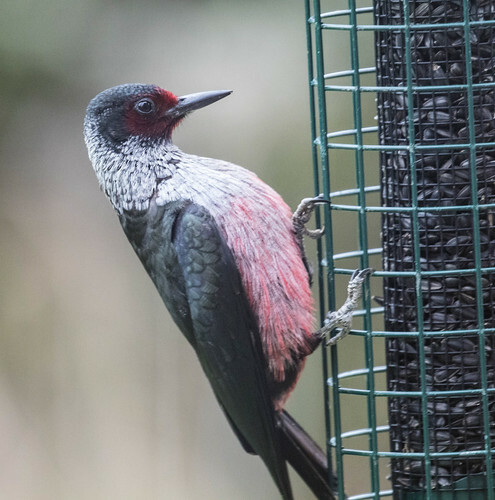 I don't chase birds that often, but Lewis's Woodpecker is uniquely beautiful—our only green and pink woodpecker. It's also uniquely historical—the only bird named for Meriwether Lewis. I've seen the species before in Nevada, California, and Colorado, but to see one in Wisconsin, in my favorite town in Wisconsin to boot, was uniquely special. It had been thundering and raining most of the morning, but the rain stopped on my drive. I made it to Port Wing just a few minutes before Ryan Brady and Nick Anich got there. The Lewis’s Woodpecker was on a telephone pole pretty far off but easy to see. And after a few minutes it flew right in to a feeder just a few feet from the window. I took lots of photos through the glass, which Leann and Mary keep pristine. I've never had such superb looks before, and never got to see so much of the pink belly. Meriwether Lewis was also taken with that feature. He wrote, "The belly and breast is a curious mixture of white and blood red which has much the appearance of having been artificially painted or stained of that colour. The red reather predominates.” Some of my photos show the red and white individual feathers blending into pink. It's easy to romanticize such a gorgeous bird, but not quite so easy to romanticize Lewis and Clark. I looked up Lewis's Woodpecker on the Discovering Lewis and Clark webpage and National Geographic’s Lewis’s Woodpecker page to learn that Lewis first observed the species on July 20, 1805, north of Helena in what is now Lewis and Clark County, Montana. 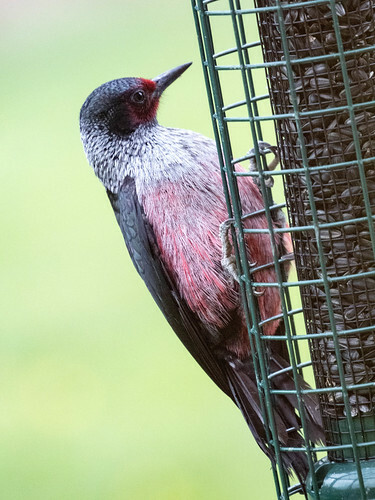 And on May 17, 1806, he wrote, "The Black woodpecker which I have frequently mentioned and which is found in most parts of the roky Mountains as well as the Western and S. W. Mountains, I had never an opportunity of examining untill a few days since when we killed and preserved several of them." Lewis realized this bird was "new to science." He brought the specimens home and gave one to Charles Willson Peale for the Peale Museum, where Alexander Wilson made a drawing from it and assigned it a scientific name, Picus torquatus. 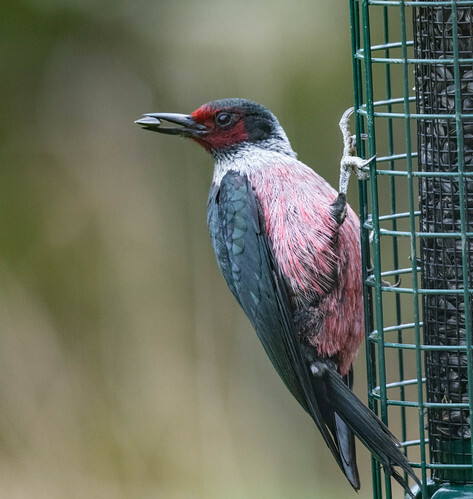 Lewis noted that the woodpecker resembled the Red-headed Woodpecker in behavior and flight. In 1831, William Swainson, the British ornithologist, apparently picked up on some similar points and reclassified it, putting it in Melanerpes, the same genus as both the Red-headed and Red-bellied Woodpeckers, and made lewis the specific epithet in honor of the man who collected the specimen he was writing about. I stuck around Leann and Mary's place for almost two hours, which was at least an hour and a half longer than the total time in my life I’ve spent with Lewis’s Woodpeckers before this, and the woodpecker stayed in view the entire time. It would fly to the feeder and pick up a single sunflower seed, then carry it off to the telephone pole to store it. During a spell of rain, the woodpecker perched, exposed, on the pole but didn't fly in. I finally left around 4:45, thinking if we get a brighter, non-rainy day while the bird is still there, I just might go back. Even if I don’t, my time with this Lewis’s Woodpecker was good enough to last a lifetime. What a treat for you....almost as good as the Cubs! !